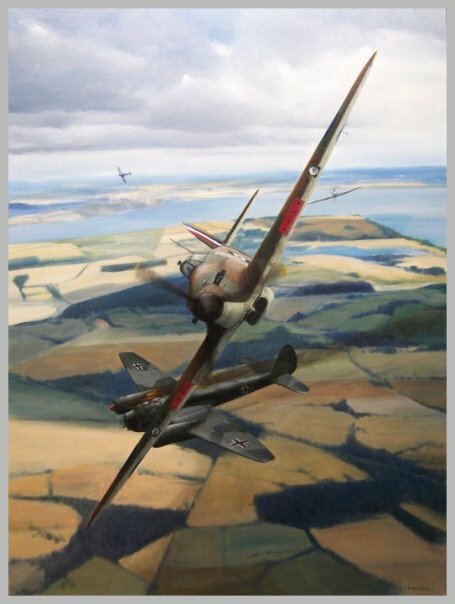 This evocative Battle of Britain combat scene has been created by Czech aviation artist Vladimir Urbanek. Entitled “First and Fastest Victory”, the painting captures a victory of Hawker Hurricane Mk.I belonging to No. 312 (Czech) Fighter Squadron, over a Junkers Ju 88 on 8 October 1940. This was the unit’s first combat since its formation on 29 August 1940. The Ju 88 made a forced landing in a field on the opposite side of the Mersey, with both of its engines on fire.